I've had good luck using a couple different methods of basement floor waterproofing to keep basement floors dry throughout the year. Having a basement floor that is always wet can be a health hazard because of mold and bacteria, it also keeps you from storing things down there or finishing off the basement for living space. One of the first things to look at when trying to figure out how to fix a wet basement floor is the landscape outside the house. The ground around the foundation should pitch away from the house. This will help shed rain water and water that comes off the roof. If excess water collects in low spots around your foundation and you don't have the proper drainage installed, water will eventually find a way into your basement. 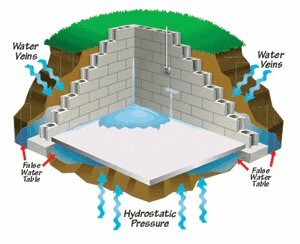 Keeping outside rain water away from your foundation walls may be the only kind of basement floor waterproofing you have to do. If that doesn't solve the problem of having a wet basement concrete floor, below are a couple of basement waterproofing systems I have used for keeping basement floors dry. 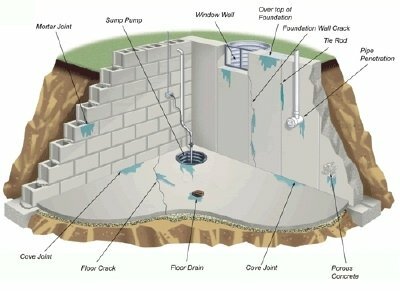 This method works very well for older houses with a rock foundation or cement block foundation where the walls leak water and/or the basement floor leaks water. This can be done whether the house has a concrete floor or if it has a dirt basement floor. After I've determined I can't correct the water problem from re-landscaping, I install 2 inches of crushed rock over the entire existing floor area. I then cut some 2 inch styrofoam into 4 inch by 8 foot long strips. I lay these strips of styrofoam around the inside perimeter of the basement walls on top of the crushed rock. If you already have a basement floor drain in one corner or along the edge of your basement walls that's great. Install a 2 inch strip of styrofoam that leads from the wall out to the drain also. If you have a sump pump pit in one corner then build out the styrofoam to reach the closest edge of the sump pump pit. If not, then I break out the concrete in one corner, dig a hole, and install a large bucket for a sump pump. Make sure the pump is in a corner where you can pump the water outside. After the crushed rock and styrofoam are installed, I lay down a layer of poly for a vapor barrier, I form around any other objects like the furnace or the hot water heater to prepare for a new 2 1/2 inch thick concrete floor. Sometimes it may be better to raise these objects and set them back down on the new dry floor. I pour a new 2 1/2 inch thick concrete floor in the basement. The new concrete is poured up against the styrofoam which is sticking up 4 inches. I leave it up higher so I can set a grade on it and snap a chalk line to use while I'm pouring the new floor. After the new floor is done, I come back the next day and pull out the 2 inch styrofoam from around the perimeter, leaving a 2 inch channel or groove around the inside perimeter of the basement. I then fill the groove with crushed rock. This basement floor waterproofing method will catch any water that runs down the walls and any water that comes up through the old floor in the crushed rock. The water will run through the rock and into the drain or sump pump. The new floor will stay completely dry. This method of basement floor waterproofing will reduce the height from the floor to ceiling by about 4 1/2 inches, but the floor will stay dry. Most water coming up through the basement floor is because it has nowhere else to go. 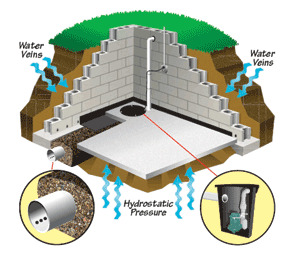 Hydrostatic pressure pushes the water up through any cracks or pores in the concrete. Once the water has an easier route to take (drainage pipes) it should relieve the hydrostatic pressure and stop coming up through the basement floor. This method works good for houses that can't give up 4 1/2 inches of head room. I saw cut the concrete floor all the way around the inside perimeter and 12 inches out from the inside perimeter of the basement walls. I remove the concrete and dig out 12 inches of dirt. I replace the dirt with 3 inches of crushed rock, then I install drainage pipe on top of the crushed rock. Once all the drainage pipe is installed I fill the remainder of the trench with crushed rock up to the bottom of the existing concrete floor. I tie the drainage pipe into a sump pump bucket in one corner of the basement where the water can be pumped outside. The crushed rock and drainage will catch any water coming from under the footings, between the concrete walls and footings, and from under the basement floor. I then pour concrete on top of the crushed rock, up to the height of the existing floor. No head room is lost and your floor should remain dry. If the walls are also leaking, the styrofoam as described above can be used here also. 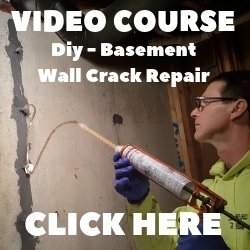 These two basement floor waterproofing techniques have worked good for me. It won't keep water from coming in through the walls but will keep the floor dry. If you're just trying to waterproof a basement floor so you can use it for storage, these methods are probably a lot less expensive than calling a company that specializes in basement floor waterproofing. 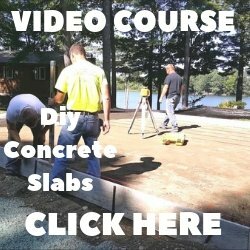 Try your local concrete contractor and compare prices. It could save you a significant amount of money. Applying a concrete sealer to the concrete is very important. RadonSeal Deep-Penetrating ConcreteSealers are great sealers that waterproof the concrete and keep radon from passing through the concrete. Consider them a must when waterproofing your basement floor. If you have a damp basement floor with no standing water, click on WATERPROOFING BASEMENT FLOORS to learn how to solve this problem.